AN ENERGETIC GUIDE TO THE STONES CURRENTLY USED IN OUR COLLECTIONS, formed in the core of our earth. 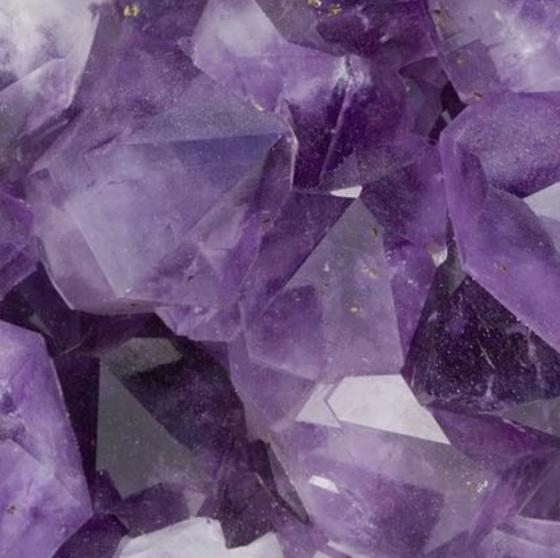 AMEthyst derives from the Greek word for intoxication. Its most recognized for encouraging sobriety, having a sobering effect on Overindulgence, substance and behavioral addictions. this stone can be found all over the earth. Ancient Egyptians wore it to guard against guilty and fearful feelings. This stone blocks geopathic stress and negative environmental energies. A variation of quartz, It is worn to dispel anger, fear and self-deception. Amethyst protects against psychic attack, transmuting it into love. This stone help support coming to terms with loss and death. Amethyst protects the wearer from negative energy, releases addictions, and helps overcome fear. Aqua Aura is a calming stone of spiritual balance and communication. Its created by bonding gold to natural quartz through a process called vapor deposition. gold vapor is added to a chamber in which quartz is heated, causing the gold atoms to fuse to the stone's surface, creating its signature iridescent sheen. This stone is known to free limitation and create space for something new. a variation of quartz, This stone carries the properties of Clear Quartz (see below). aqua aura quartz deepens spiritual attunement, and is excellent for activating your soul's purpose. Wear it to bestow profound peace during meditation. this stone activates the third eye as well as the throat chakra, enhancing intuitive communication that comes from the heart, not the ego. This stone is revered as a talisman of protection. It serves as a psychic shield, deflecting negative energy. It protects against radiation and pollutants in the environment including cellphone emanation. TOURMALINE is pyroelectric, (it generates elecrticity with heat). it balances chakras and auric bodies, forming a protective shield. this stone is helpful in understanding, ourselves as well as others which inspires confidence and neutralizes fear. black tourmaline grounds the base charka, increasing vitality. It drives away feelings victimization - encouraging positive attitudes, neutralizing thoughts and internal energy, transmuting them into positive, constructive energy. Green Fluorite aids access to intuition. It grounds excess energy and dispels emotional trauma. Many healers use this stone to balance the heart chakra and clear mental blocks, chakras and to clear infections. Its energy stimulates the electrical charge of brain cells, drawing in more life force (prana) as it encourages both hemispheres to work harmoniously together in balance. this makes it increase concentration and helps retain new information. it dissolves fixed behavioral patterns and inspires a feeling of stability and order. It helps information from the subconscious mind come to light, helping to manage disorganization, bringing order to chaos. this crystalline stone is not an actual diamond, but a high grade, double terminated variation of quartz, so It carries its properties as well (see below). additionally, it is a powerful stone of spiritual attunement, it stimulates metaphysical abilities. it connects you to your inner light and links you to spirit guides. It promotes dream recall and past life information, making it i useful for understanding karmic lessons being dealt with in present life , as well as highlighting karmic reasons for disease. It is a great crystal for clearing electromagnetic pollution. a soul-healer, it helps bring your purpose to light. Pyrite is a cubic stone found in spain, the us, portugal, italy, the uk, chile and peru. it is known as the stone of action and vitality. It is a powerful crystal for manifestation & creativity. It is known to strengthen self-esteem and confidence, inspiring a positive perspective. It blocks out negative energy and pollutants at all levels. pyrite comes from the greek word for fire, it was believed that it held fire in its core. It sees behind a facade to what is, helping transmute feelings of inferiority to confidence. Wear it for boldness and assertive action. This crystal is known as the master healer. this crystal is mined all over the world. Native Americans, Ancient Egyptians, Aztecs, Romans and many other cultures have used it for millennia for healing and spiritual development, as It amplifies the energy and intention that is programmed into it. Native americans called it the brain cells of the earth. it enhances physical energy and brings the body into balance. quartz is piezoelectric, it produces energy when subject to heat or pressure. this property makes it able to receive, process and transmit energy. scientists discovered that the vibrations quartz is able to collect and transmit can amplify, store and focus other vibrational frequencies of energy and information. quartz is used in all types of technology, including sonar, watches, radios, computers, cars and even satellites. when held, quartz doubles your biomagnetic field. Additionally, it increases the energetic properties of any crystal it is worn with. It balances and revitalizes the physical, mental, emotional and spiritual planes. SMOKY quartz is a powerful grounding and cleansing stone. it is known to transmute negative thought patterns as well as energy such as fear, grief, sorrow and depression. a variation of quartz, This stone carries the properties of Clear Quartz (see above). It serves as an anchor to the natural world, protecting from nightmares and stress. it inspires a powerful connection to the earth, inspiring ecological solutions. this stone has been used to lift fear, and create emotional balance. smoky quartz helps detoxify at spiritual and physical levels, making it a an excellent support for radiotherapy. this stone helps face hardship and stress with equanimity. it teaches one how to leave behind what no longer serves our greater good making room positive energy to flow naturally . wear it to neutralize negative vibrations within and around you. a variation of quartz, This stone carries the properties of Clear Quartz (see above). It connects you to your highest self, dissolves energy blockages and purifies energies. This quartz is mined in the Himalayan Mountains of Tibet, one of the most sacred places on Earth. The mines are not easily accessible by machinery, so many of these stones are mined by hand, by monks themselves. The high vibration of this place is imparted onto these stones, making them highly spiritual stones. tibetan quartz creates deep healing by bridging energy gaps in the alignment of the chakras. It is useful for understanding karmic lessons being dealt with in present life , highlighting karmic reasons for disease and life lessons. Also known as Rainbow Aura Quartz, this stone is enhanced by an alchemical process. Titanium and Gold molecules are bound to clear quartz by the natural electrO-static charge of the crystal in a process using magnetron ionization. This treatment enhances the stone's original properties to bring insight, excitement and joy into life's experiences. because it is quartz at its core, This metallic stone carries the properties of Clear Quartz (see above). It clears a path for life force to manifest, bringing a new joy for life. It aids in releasing past karmic ties, brings projections to light and releases resentment, making it particularly helpful in healing dysfunctional relationships. It is known to increase life force and vitality, promote harmony, enjoyment of life and disspels sorrow.